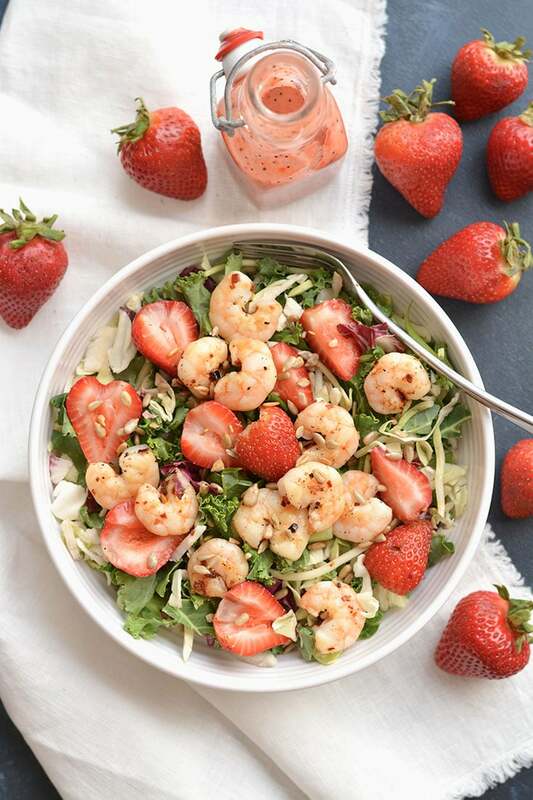 This Shrimp Strawberry Poppyseed Salad post is sponsored by Eat Smart as part of an Influencer Activation for Influence Central and all opinions expressed in my post are my own. One of the biggest struggles I’ve had to deal with since losing 80 pounds is eating outside my comfort. For years, I would eat the same meals over and over because it was, well easy. I also feared if I branched out of that routine I’d gain weight which was just silly. Now as a nutrition practitioner, I know how dangerous this is as it can lead to nutritional deficiencies and obsessive behaviors with food. I see some of my weight loss clients doing this, which is why I’m always encouraging them to switch up what they’re eating. You eventually have to learn how to be comfortable eating in the real world and trusting your body. 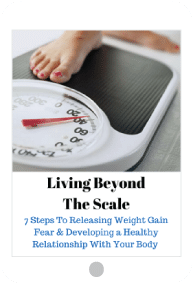 For years, I traveled as a consultant post my weight loss. This forced me to get comfortable with eating different foods. No matter how much I planned, I was faced with the inevitable of not knowing what meals or foods would be available to me in the new city or country of the week. 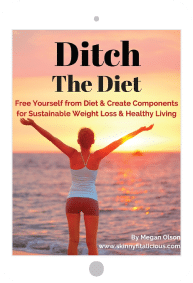 I eventually became comfortable with figuring out what healthy things to eat and how to balance it. When I stopped traveling this comfort carried over at home, and that’s when I started cooking and experimenting with different meals at home. My biggest advice to someone struggling with this is to start by switching one meal a day. For example, I always eat a big salad for lunch. Instead of putting the same three foods on it every day, I make an effort to switch the protein and produce so it feels familiar, yet tastes like a brand new recipe. 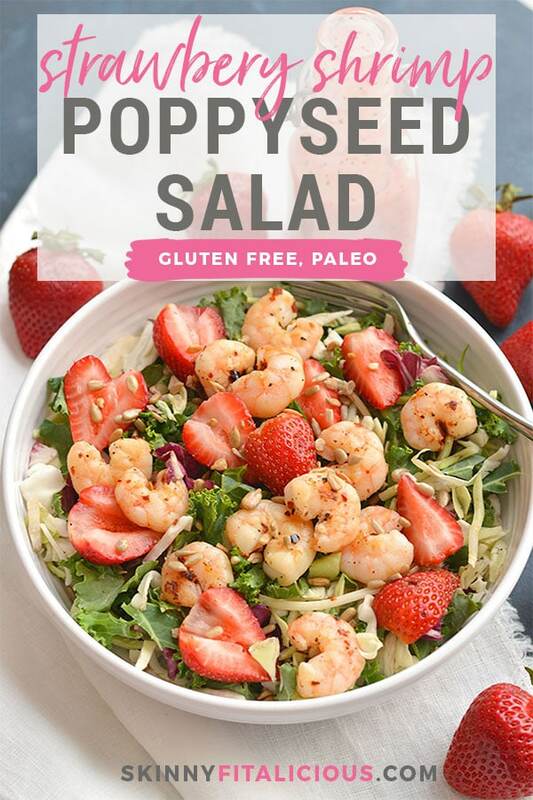 This Shrimp Strawberry Poppyseed Salad is the perfect example of that! 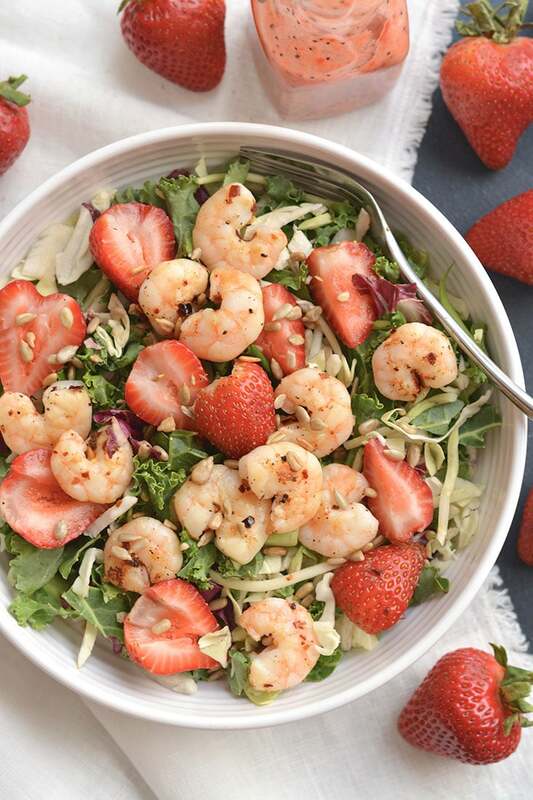 Grilled shrimp with lemon and crushed red pepper flakes with fresh greens and strawberries. 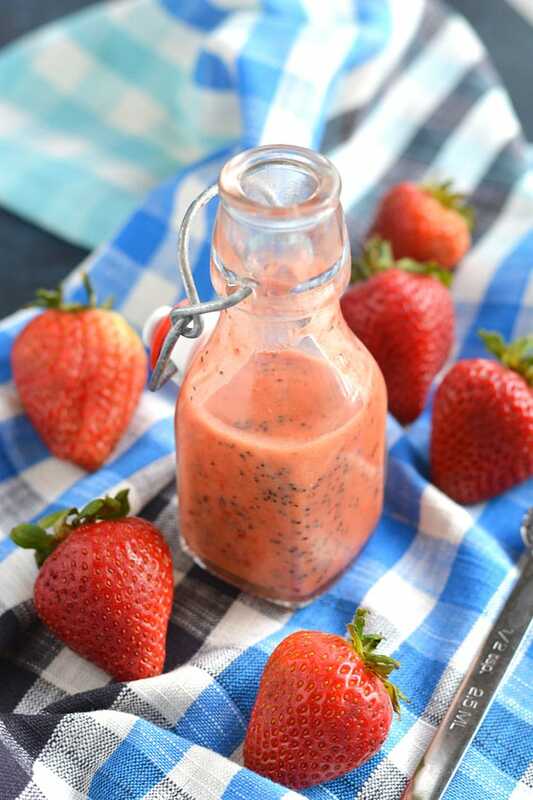 Drizzled in a homemade strawberry poppyseed dressing. 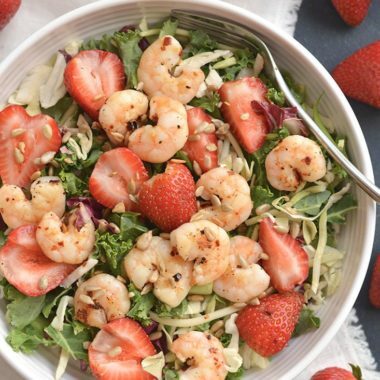 The combination of spicy and sweet in this salad is so good! Tasty, light and filling for a summer day. For the greens, I used Eat Smart Strawberry Harvest. It’s one of their salads that has a 100% clean label. Eat Smart is one of few brands that’s committed to offering clean ingredients and labeling by having a 100% clean labels on all their products by 2018. That means no high fructose corn syrup, artificial preservatives, hydrogenated fats, artificial colors, flavors or sweeteners. Nearly 90% of their products already contain a clean label including the products you see in this post. 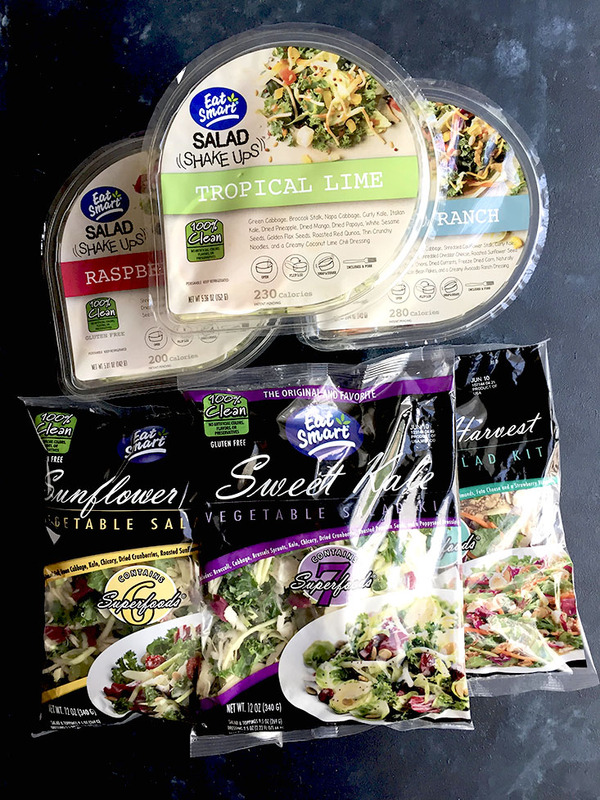 I love that Eat Smart is committed to making healthy eating simple for consumers not only by providing clear and understandable labeling, but also by offering healthy options on the go so if you don’t have time to make a salad from scratch you can grab an Eat Smart salad and take it with you on the go. Just add a lean protein and you’ve got an easy and healthy meal. With their new salad shake ups, the salad comes in a sturdy, deep bowl with a lid so you don’t even need a bowl. Love it! Preheat a skillet or grill pan to medium heat. Add extra virgin olive oil and minced garlic to the pan. Cook 2 minutes then add shrimp with lemon juice, salt, pepper and crushed red pepper flakes. Cook 2-3 minutes on each side until opaque. 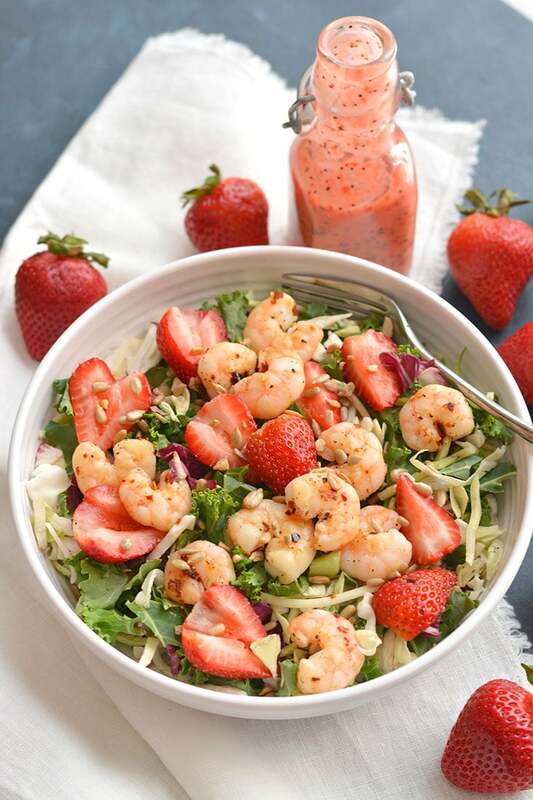 Next prepare the dressing by adding all ingredients in a blender and blending on high until strawberries are broken down. Place in the refrigerator while you make the salad. 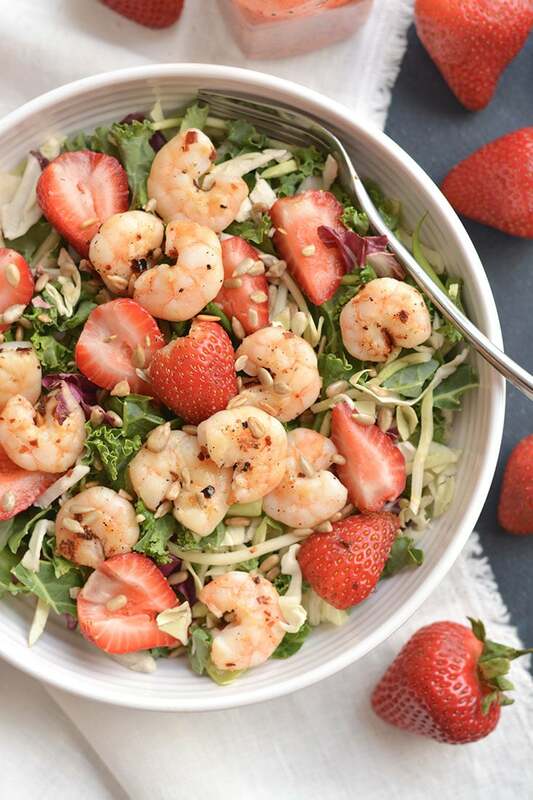 Assemble the salad by placing greens in a large bowl and topping with sliced strawberries, shrimp and sunflower seeds. Drizzle 2 tbsp of the dressing on the salad. *Dressing makes ~2 servings, 1 serving equals 3 tbsp. **Nutritional Value does not include dressing. Ohh the salad looks so awesome and colorful, but that dressing looks like a show stopper! I love the sweet and savory mix. Haha, the dressing really is yummy. Yum, I love strawberries in salad. It screams summer. Thanks Ashley! Yummy! I wish I could order something as yummy as this when I eat out! 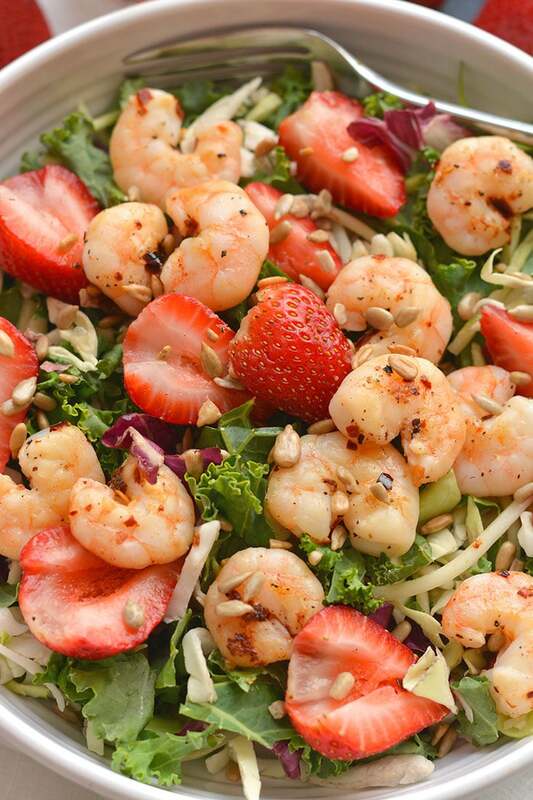 It has always surprised me how well shrimp and berries go together. Blueberries are another good pairing! you know i love this combo. Its like summer in bowl! GLOW BLOW! ohhh yea! You surviving summer ok? Heat wise? and catch me up on life! Glow bowl! LOL Love that! I think I need to make a new recipe with that name. OMG it’s so hot here. Record highs this week! Everything is good here. I’m good, he’s good, just really hot!